I don’t think (and I’m sure they’ll correct me if I’m wrong) I’ve ever given my siblings anything really bad to eat. Sometimes they eat my recipe fails, but only the most edible ones (cupcakes that are just slightly too dense, cookies that are a tad too crumbly), and I never did anything as treacherous as trying to pass off bean brownies for regular brownies, which one of my sisters actually did do to me one time (a deception I’ll never forgive). So it’s slightly insulting to me that, when presented with any dessert that isn’t an obvious cake, cookie, or cupcake, they proceed with severe trepidation. Forks hovering nervously over their plates, eyes narrowed, skeptical, seeming to suggest — It could be an anthrax pie, how can we be sure it’s not? So much for gratitude. 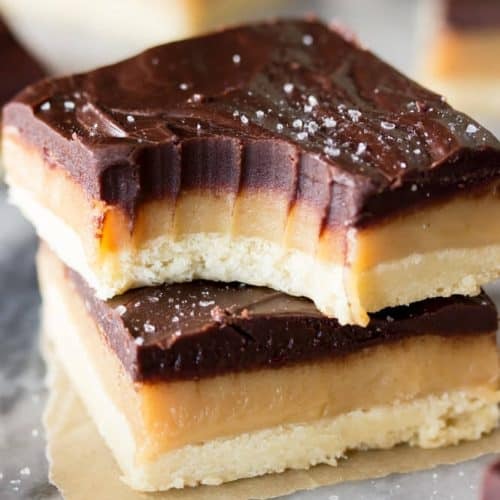 But after explaining for the fourth time to my fourth sibling what Millionaire’s shortbread even is (“It’s like a fancy, homemade, gourmet twix bar”) not a single one seemed the least bit disappointed when they took their first bite. 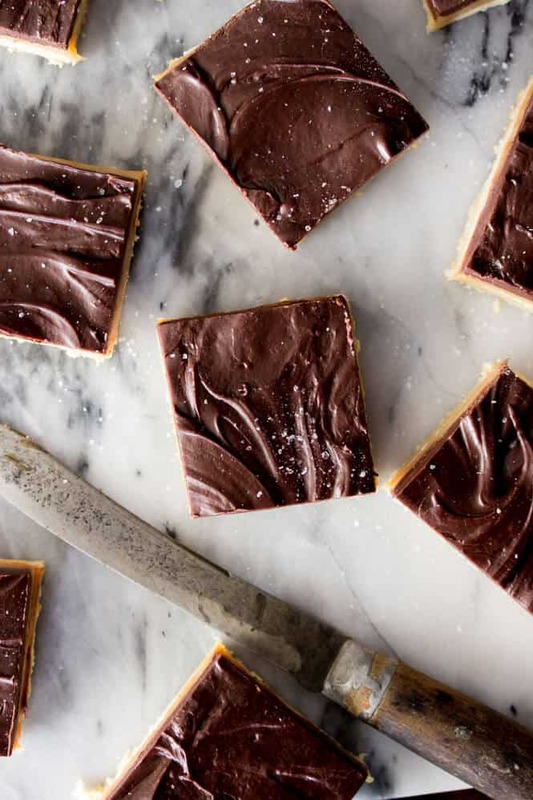 There’s nothing to be disappointed about when it comes to Millionaire’s shortbread. This is a recipe I’ve been wanting to try my hand at for a while now and after a lot of running around in the kitchen I’m very happy to share it with you. I don’t think I need to reiterate the fact that it’s a rich dessert — in fact I suggested to my sisters and brother that they cut each giant square into quarters, because while big squares look pretty in these pictures, they’re so rich that it’s a challenge to actually eat a whole one. 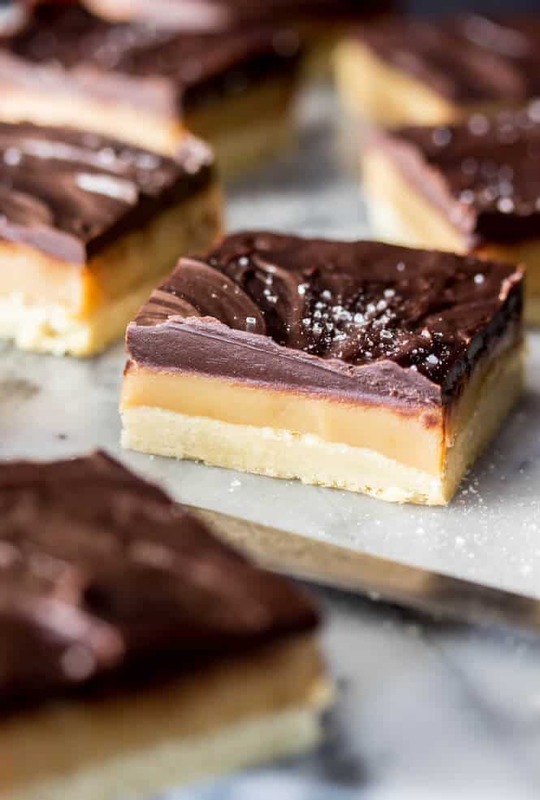 The shortbread (a faux shortbread, more on that below) is slightly sweetened but serves as the crispy vehicle to transport chewy caramel and a blanket of chocolate ganache. To make things even more decadent, it’s all topped off with a sprinkle of sea salt. 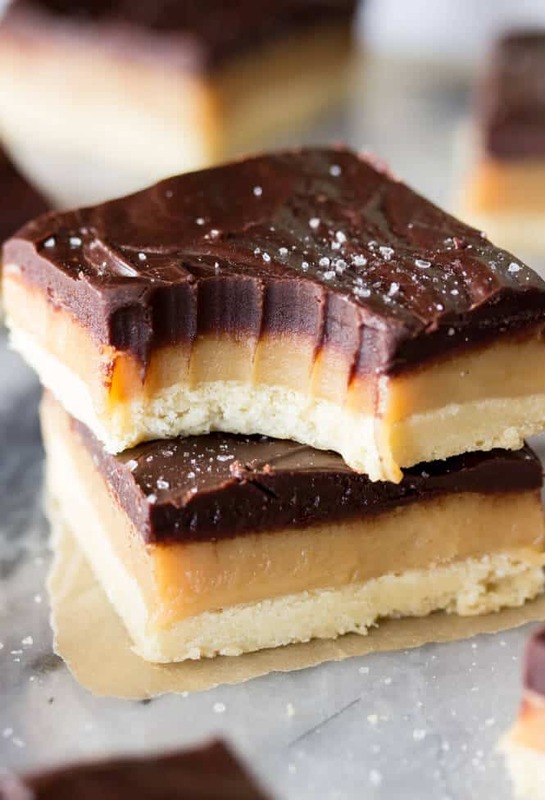 It’s not called Millionaire’s shortbread for nothing! As attaining millionaire status can change a person, so it has changed our “shortbread” cookie crust here. Surprise, it’s not a “true” shortbread. When I decided to give this classic recipe my own spin, this is one of the first changes I made. 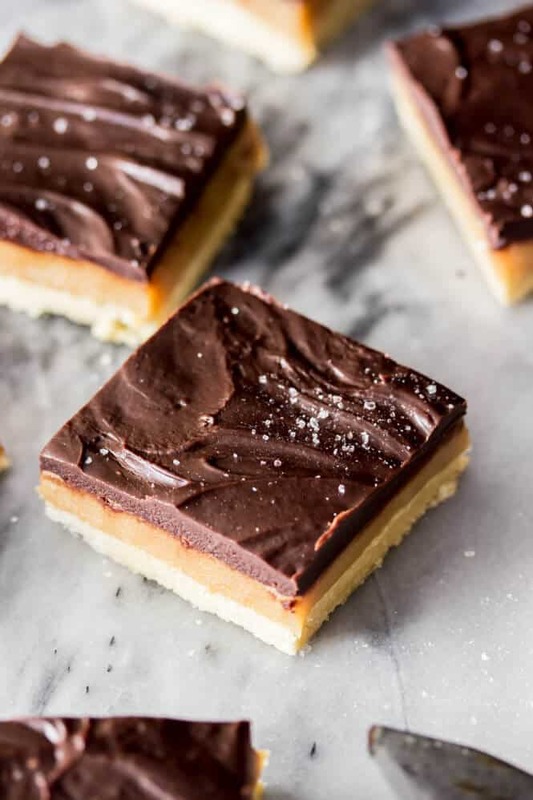 Classic shortbread is made of only three ingredients — butter, flour, and sugar, but this is Millionaire’s shortbread so we’re making sure it lives up to its name. An egg yolk, some brown sugar, and vanilla extract all make this cookie crust extra flavorful, and slightly softer than standard shortbread as well. 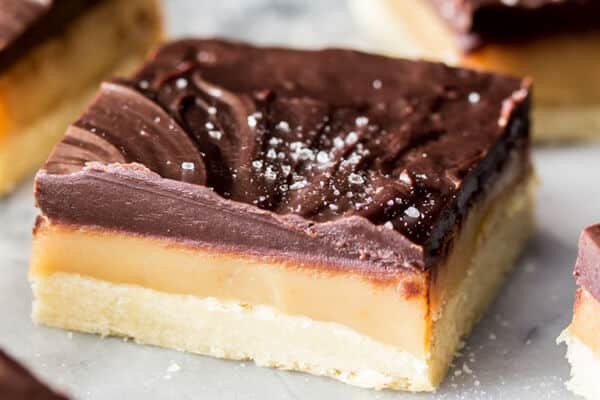 Because of the added ingredients, your finished millionaire’s shortbread will cut more easily than standard shortbread (which usually breaks unevenly with jagged edges and scatters crumbs everywhere) but is still crisp and snappy beneath the soft chocolate and chewy caramel. Andi liked the cookie layer so much she asked me to make her a pan of just that alone, nothing else. I really wish that I could photograph the processes for these multi-step recipes — a picture of how the crumbled cookie dough should look, the caramel at its peak just before pouring it over the shortbread, the glossy chocolate ganache, etc… but since I only have two days of the week to shoot 3-4 recipes, I usually have to prepare the food Friday night, and there’s no light to take decent pictures then. 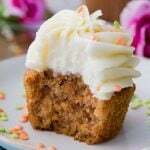 To make up for this, I try to include very detailed descriptions in the recipe, and you can always shoot me an e-mail, leave a comment, or drop by my Facebook page if you have any questions. 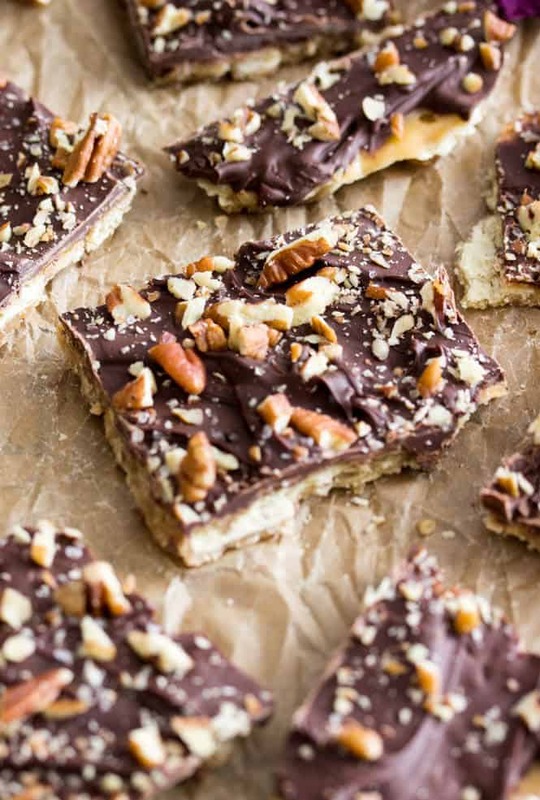 That being said, I don’t really think you’ll have any problem with this recipe, the trickiest part is the caramel and it doesn’t even require a candy thermometer! I hope you enjoy this Millionaire’s shortbread as much as my siblings ultimately did! 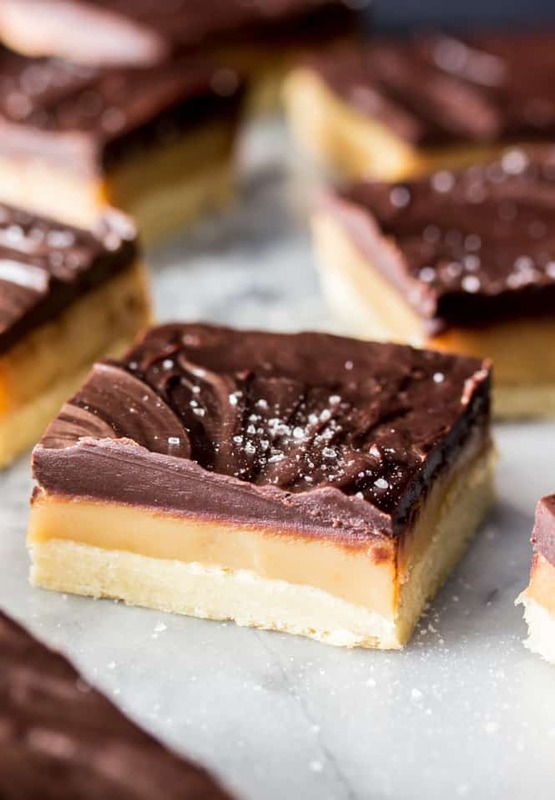 A sweet treat so decadently rich it's been named "Millionaire's Shortbread". Preheat oven to 350F (177C) and line a 13x9 baking pan with parchment paper. Using an electric mixer, beat butter until well creamed. Add sugars and beat until light and fluffy, about 30 seconds. Add egg yolk and vanilla extract and stir well, pausing to scrape down the sides and mixing until ingredients are well-combined. Don't over-beat the dough, you want it to be slightly crumbly to make it easier to press into the pan. Drop dough over prepared pan and gently, firmly, evenly, press dough into the bottom of the pan. 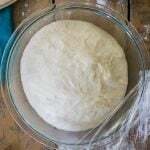 To make it easier, I usually lay a piece of wax paper over the dough and use the palm of my hand to smooth the surface (and then discard wax paper). Bake on 350F (177C) for 20-25 minutes -- edges should be lightly golden brown. 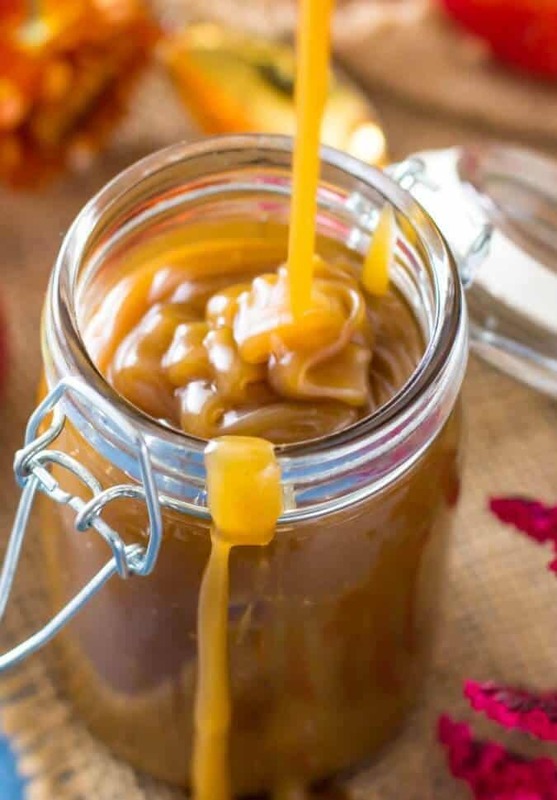 Allow to cool while you prepare your caramel topping. Combine condensed milk, butter, brown sugar, and corn syrup in a medium-sized saucepan over medium heat. Stir frequently until butter is melted and ingredients are well-combined. Continue to stir constantly until mixture begins to boil (this could take several minutes, but you don't need to increase the heat). Once mixture comes to a boil, reduce heat to a simmer (slowly bubbling), still stirring constantly. Continue to stir 10-15 minutes until mixture turns a rich caramel color and has thickened (should begin pulling away from the sides of the pot as you stir). Remove from heat and immediately stir in the vanilla extract and salt. 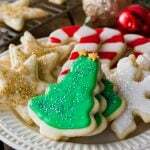 Pour evenly over prepared shortbread, use a knife to spread evenly if needed. 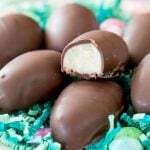 Allow to cool at room temperature for several hours or in the refrigerator for 1 hour before topping with chocolate. Combine chocolate chips and heavy cream in a small saucepan over medium heat. Remove from heat and stir in vanilla extract. Allow chocolate to cool just slightly for about 5 minutes, and then evenly spread over prepared caramel layer. Wait several minutes and then sprinkle with sea salt. Allow chocolate to harden (I recommend placing in refrigerator for about 30 minutes -- my family prefers these treats refrigerated anyway) before cutting and serving. 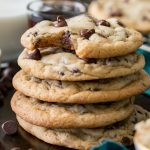 Can I double this recipe or do I need to make two separate batches? Some recipes don’t work well when doubled. Thanks! 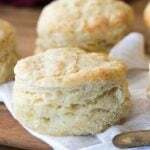 Hi Bonnie, I think I would do two separate batches. Enjoy! Hi. I only have one can of condensed milk and i cant find one more now. Can i replace the other can with half cup of heavy cream or any other things ? Thanks for the recipe. I only have one can of condensed milk. And cant find one more at the moment. How can i replace it ? Maybe 100 ml of heavy cream ? I finally made these today, absolutely amazing. This reminded me very much of a twix, but better. 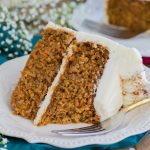 I have been slowly working my way through all the recipes on this website and have been pleased everytime. Thank you so much for all your inspiration. Another question — can these be made ahead and frozen or stored for several days. If so can I complete all steps and then freeze or should I freeze, thaw and then put the ganache on? I want to thank you for this recipe. I have a Mary Berry cookbook from many years ago and it has this recipe in it but is written for the person who knows and understand grams (I’m not one of them) since everything is weighed. I have tried to look at conversion charts from grams to cup, etc., but they seem to differ somewhat and I do not want to add to much or too little following those charts. 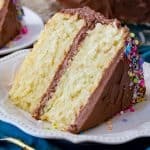 Again, thank you for posting this so we who bake “American style” can make these fantastic goodies. cut it in half crosswise and then cut those 2 pieces in half again which will give you 4 pieces. Now take the first piece of the four and cut it into 10 strips (pieces) . When you get done doing the 4 pieces , you will end up with 40 pieces of this candy instead of 28 . Hope this helps you folks out especially if you are planning on giving some away for a gift. Hi! This looks so good and I am really eager to try this out! Where I live though, it’s almost impossible to find corn syrup… Can I substitute anything for it? Thank you! Hi Anna! Do you have Golden Syrup where you are? That will alter the flavor a bit (likely not in a bad way!) but would work. This may be a silly question, but is the butter called for in the caramel here also unsalted? My mother-in-law made this for dessert the other day, and it was uh-may-zing. Don’t want to ask her, though. Hope she doesn’t see this comment. 😉 LOL Thanks in advance! Hi Jen! Yes, unsalted for both 🙂 Enjoy! This was amazingly delicious. My wife and I watched an episode of The Great British Baking Show which features a challenge to create these. 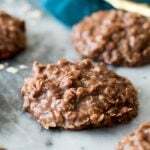 We were intrigued and found this recipe to make ourselves. Turned out fantastic and now we have a full tray of them that we will have to give to other people or we will eat them all in a day haha! Made the Millionaire’s Shortbread yesteay. Followed the recipe exactly. Delicious! It was the first snack on the table to disappear. Thanks! Hi Kathy! I don’t think you should need to lower the baking temp but it will need to bake longer. I am sorry, I am not familiar with egg substitutions, maybe someone else can chime in. 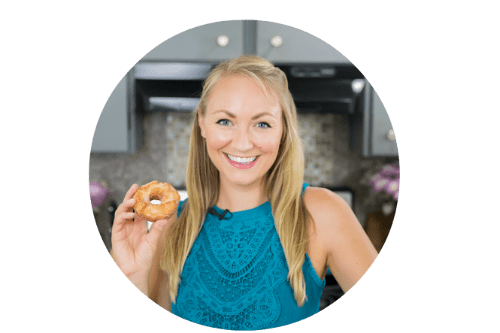 There are flax “egg” recipes on the internet—you mix flaxseed with water and wait until it gels a bit. I think you can try coconut milk to exchange for the condensed, but I’m not sure what ratio to use. I am a vegetarian too. 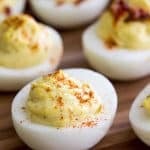 I am allergic to eggs, so I had to find a recipe without them. Just make a shortbread without eggs. 2 cups of AP flour. 1/2 cup granulated sugar. 3/4 tsp salt and 16 tsp of unsalted melted butter. There’s your shortbread. God bless.